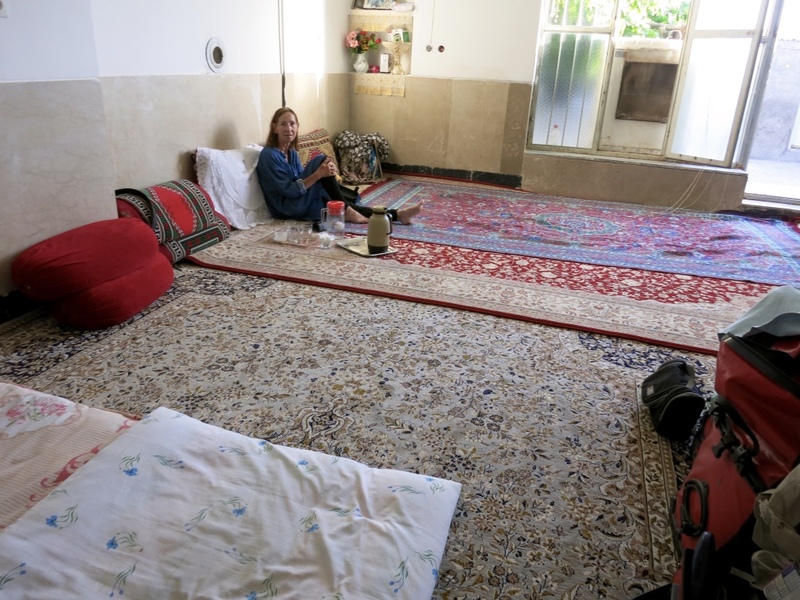 After leaving Persepolis we had hoped and expected to find accommodation in Saadat Shar, but there was none. So we continued and were told to find a place to sleep 20 k further at Pasargad, another archeological site. Wrong. 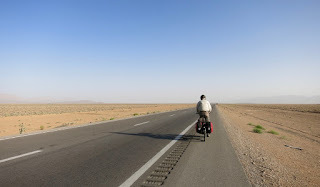 Though we now use to start our cycling at six in the morning, at eleven temps are over 30˚C and there's only bare desert land. We are not fond of camping in the wild, but in this landscape, with rocks, sand, thistles and no trees or water, we don't consider it at all. Then we got a lift on the blue pick-up truck of Hamid. Hamid is a sailor and is on a 6 months leave. During his leave he tends the cows of the family. After a 50 km drive we found that the next hotel was closed because of Khomeini's birthday and so Hamid took us all the way back to his family's house in Qaderabad. A simple farmer's family with the basic facilities that such country families have here. Very kind people who all wanted to greet us and speak to us (hardly possible). The next morning Hamid, who had slept with the cows, brought us back again to the main road (60 km) and on we rode. To Abadeh, where we had a very nice hotel. 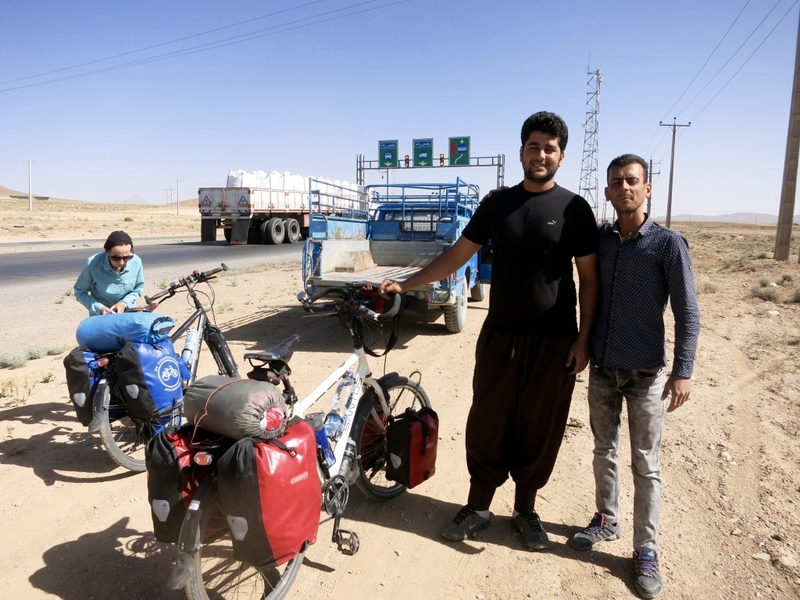 From there we lifted again for some 50 kms, so that we ourselves could ride another 80 km to Shahreza, our last stop before Esfahan. In Shahreza we were invited to private homes three times, but we refused these kind offers, or better requests, since we wanted to be on our own. Being in the house of strangers, no matter how kind they are, not being able to have a normal conversation with them and not knowing what will happen next and when is rather tiring. So after some trial and error we found this caravanserai hotel next to an enormous and very famous (in Iran that is) shrine. 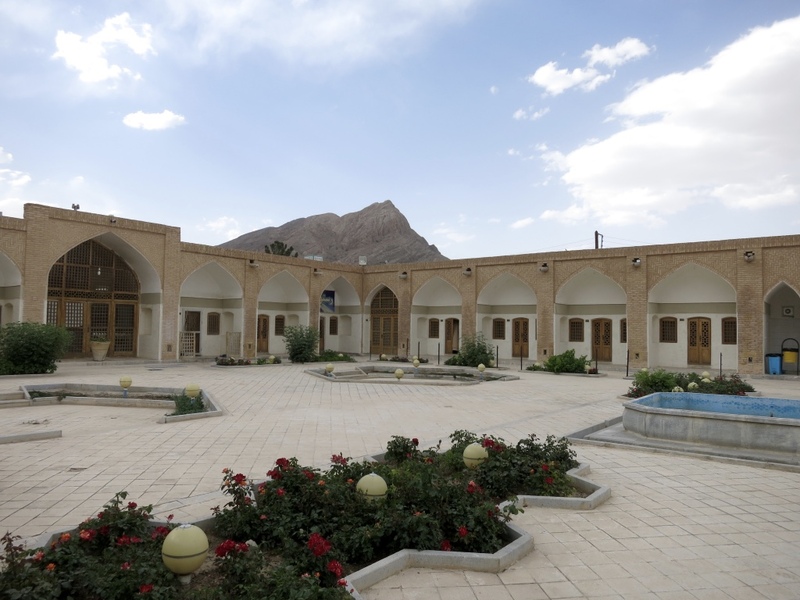 The hotel was a former caravanserai, which means that it was the place where long ago the caravans of camels and horses of the traders used to stop for the night, for commerce, for refreshing etc. A square inner courtyard surrounded by storage rooms, that are now the hotel rooms. Very historic and very agreeable. In the mean time we had contacted Majid, a WS-host in Esfahan, who helped us find an appartment for our own in the centre of the city, where we have stayed now for a number of days.